These were nice but would be best with a nice 'creamy' soup - like a roasted garlic and potato soup, as I did find them a tad dry. Great flavour though and will make again next time I make soup. Heat oven to 220 degrees. Mix together the flour, yeast and salt. 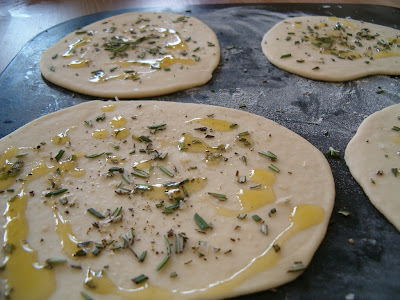 Add the oil, then pour in enough water gradually to make a soft dough. (I didn't need all the water). Knead on a lightly floured surface for about 4 - 5 minutes until the dough feels strong, bouncy and has a silky feel to it. Cut the dough into 4 pieces, roll out into rough rounds about 10 - 15 cm in diameter. 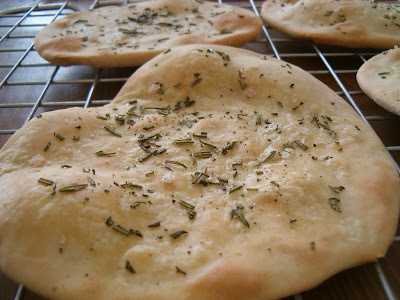 Sprinkle a baking sheet with flour, lay the breads on and let them sit for 5 minutes, then scatter with the rosemary, smoked sea salt and drizzle with the olive oil. Bake for 8 - 10 minutes until they puff up and are golden. Remove to racks to cool. Can be made 3 -4 hrs ahead.